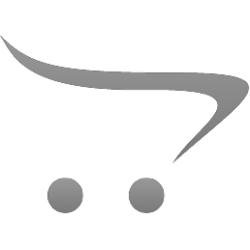 Born in Illinois and educated at the Chicago Academy of Fine Arts and the American Academy of Art, Terpning first gained attention through his advertising and editorial illustrations. His vision became the force behind such classic movie posters as “The Sound of Music,” “Dr. Zhivago” and the 1967 re-issue of “Gone with the Wind.” Always a Marine, Terpning answered the call again, making combat patrols around Da Nang with a camera and sketch pad for the Corps in VietNam during 1967. 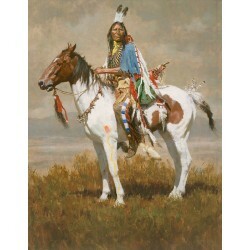 But his love of the West and Native American traditions fueled his transition to fine art. 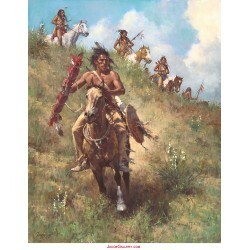 He has become known as the Storyteller of the Native American because of his devotion and respect for the Plains Indian. 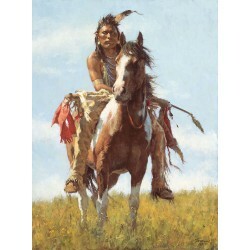 “He is simply the best and best-known artist doing Western subjects at this point. 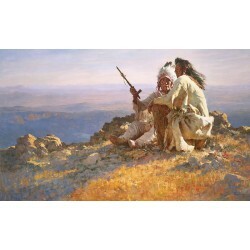 He is among a very small group of painters of the West in the late 20th century whose art will still be hanging in museums and appreciated a hundred years from now.” His work has been exhibited around the world and collected in museums including the Autry National Center, the Phoenix Museum, and the Booth Western Art Museum along with many of the most prestigious private collections today. 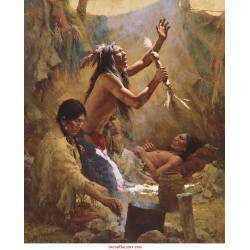 Title: Do not Disturb Limited Edition Giclee Canvas Size: 23" x 31" Collector's Edition of: 85 Capturing the humanity of..
Medicine Man of the Cheyenne by artist Howard Terpning Spirit of the Plains by artist Howard Terpning Transferring the M..
Limited Edition Giclee Canvas Anniversary Masterwork Size: 39" x 47" Collector's Edition of: 85 One of the most ..
Limited Edition Giclee Canvas Size: 21" x 37" Collector's Edition of: 150 They followed the warrior’s way as proud horsem.. 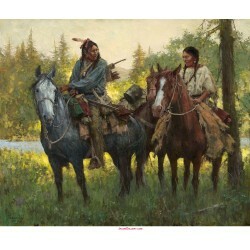 Artist: Howard Terpning Limited Edition Giclee Canvas Size: 31" x 39" Masterwork Edition of: 75 20 AP (Artist Proofs) T..